It wasn’t often that Michael Jordan, Scottie Pippen and the Bulls found themselves entering a playoff series as the lower seed. But when it did happen, including twice in the NBA Finals, winning at least one of the first two road games to take control of home court advantage was of vital importance. So it comes as no surprise that Pippen views that as a key for the fifth-seeded Bulls when their postseason gets underway Saturday in Brooklyn against the fourth-seeded Nets. With Joakim Noah going up against Brook Lopez, two of the East’s best centers will face off as the Bulls take on the Nets. Chicago started their NBA Finals series on the opponent’s turf in 1993 against Phoenix and 1998 in Utah. Both times, the Bulls were able to win at least one game – they captured two victories over Charles Barkley’s Suns in 1993, though Phoenix returned the favor winning two of three games at the Chicago Stadium – to wrestle home court away en route to a series victory. Whether or not this season’s Bulls can also find success away from the United Center in the postseason may largely depend on the team’s health. Not including Derrick Rose’s absence, Chicago players missed a total of 107 games due to injury this season. Most recently, Joakim Noah (right foot) missed 15 games, while Taj Gibson (left knee) was sidelined for 17 games this season. Both have worked their way back into the lineup, though they played limited minutes in the season’s final two games. Pippen calls Gibson, who averaged 8.0 points and 5.3 rebounds in 22.4 minutes per game this season, Chicago’s X-factor for the series. “He’s someone who can come off the bench and give you a double-double in addition to what the starters are providing,” Pippen said of Gibson. “He’s also the anchor on the defensive end when he’s on the floor. His energy and enthusiasm is a big part of the second unit. 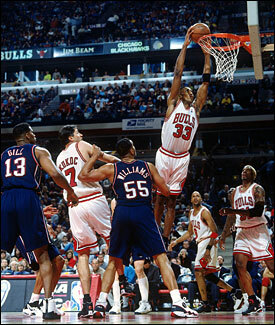 The Bulls and Nets have met just one other time in the NBA Playoffs–Chicago swept New Jersey 3-0 in 1998. The Bulls won three out of four meetings against the Nets during the regular season, which Pippen said will give them a mental edge going in the series. Aside from that, however, what happened prior to this point won’t have much meaning once Game 1 at the Barclays Center has commenced. One matchup Pippen said he’ll keep a close eye on is at center, where Noah will face off against Brook Lopez. Both big men were first-time NBA All-Stars this season and which player has the advantage could depend on whether Noah is able to play with his trademark high energy, activity and mobility. Chicago finished the season 33-18 against the Eastern Conference this season, including a 16-10 mark on the road. The Bulls won once in Brooklyn this season, and Pippen is convinced they can do it again in their first round series.